Most people know that mushrooms have a shorter shelf life than fruits and vegetables. Mushroom hunters are even more familiar with this notion, as a wild-picked mushroom should typically be consumed after no more than a few days in the refrigerator. Right about this time of year in the middle of winter, those pickers inexperienced in preservation are learning that a shroomless winter is especially tough after the fall season, which produces loads of wild edibles. There is no better time than now to learn about the bounties that could have been stockpiled. Here are the all-time best ways to preserve mushrooms. Even folks in typically frigid locations can enjoy a treat in winter. Experienced pickers know that a few species, notably the oyster mushroom, are well known to rear their caps during the typically fruitless months of winter. In the case of a rogue winter thaw, take to the woods to find the fleshy oyster caps growing on dead and dying hardwood. The fuzzy-stemmed velvet foot mushroom can also be found in the winter, though extreme care should be taken in the identification process, as it has some similarities in appearance to the deadly galerina. Regarding preservation practices that can be used year-round, most mushrooms will hold for months or more through the long-embraced practices of drying or freezing..
A common passed-down practice after bringing mushrooms home is to boil them before cooking, but pickers who have tried and tested different methods agree that boiling, thought it may kill off bacteria, is not a good idea due to its ability to remove flavor. Many refuse to even rinse mushrooms, and prefer rather to cut off any questionable piece and clear the rest with a mushroom brush (or equally capable toothbrush). When drying, cut bite-size or slightly larger pieces flat to fit on a dehydrator. If a dehydrator isn’t available, an oven set on low heat with the door left cracked open will work, too. Even air-drying works, but takes significantly longer. Make sure the mushrooms are dried to the point of snapping when you bend them. Anything less will leave them moist, even if they feel dry. Do not seal them right away, but rather let them sit on the dehydrator to air out, because the heat present in the mushrooms could cause moisture buildup if you seal them right off the drier. 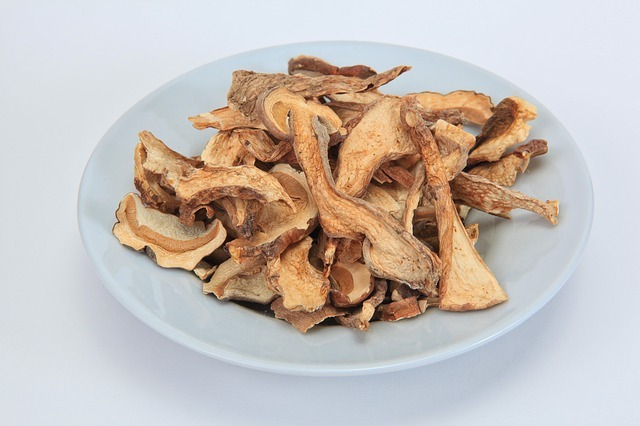 Rehydrate mushrooms by dropping dried pieces into a boiling pot of water and letting simmer on low heat for 30 minutes. Then strain the mushrooms and other debris out of the leftover water, using the mushrooms for cooking and the remaining aromatic liquid for soup stock. Freezing mushrooms entails cooking before storing. One method is to saute mushrooms, then let cool and put in a freezer container. Blanching and steaming mushrooms works as well, but mushrooms should be immersed in cold water to cool them before straining and storing in a container. Frozen mushrooms should be added directly to a dish without thawing first. Always consult a mushroom field guide and preferably have an experienced picker along for the hunt, and never consume any mushroom whose identity is in question. For a scientific approach to all things mushrooms, visit the Mycological Society of America or the North American Mycological Association. Professional oyster information can be found at MushroomExpert.com. More details on mushroom toxins can be found here.